1. 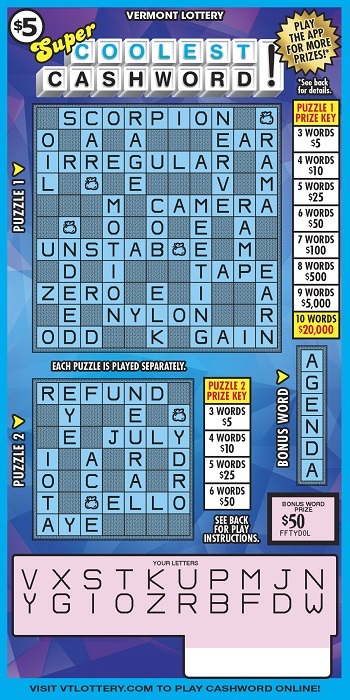 Scratch off all YOUR LETTERS. 2. Gently rub, mark or circle the same letter each time it is found on the CASHWORD PUZZLE 1, PUZZLE 2 and BONUS WORD spot. For example, if the letter E is revealed in YOUR LETTERS, rub all E’s in the CASHWORD PUZZLE 1, PUZZLE 2 and BONUS WORD spot. 1. The words to be completed are shown on the CASHWORD PUZZLE 1, PUZZLE 2 and BONUS WORD spot. 2. If the revealed 20 letters form 3 or more completed words on the CASHWORD PUZZLE 1, or PUZZLE 2, you win the corresponding prize shown in the prize key for that PUZZLE. If the revealed 20 letters complete the BONUS WORD, you win the prize shown in the BONUS WORD prize spot. 3. Scratch each of the ( ) symbols in the CASHWORD PUZZLE 1 and PUZZLE 2. Each ( ) symbol is a Free Match and counts as a matched letter in that possible complete word. 4. You must match all the letters of a word on the CASHWORD PUZZLE 1 or PUZZLE 2 to have a complete word. Every single letter in a word on the CASHWORD PUZZLE 1 or PUZZLE 2 must be revealed in YOUR LETTERS. 5. A complete word must contain every single letter of a horizontal or vertical word on the CASHWORD PUZZLE 1 or PUZZLE 2.
a. consists of a string of 3 or more unbroken letters. b. occupies an entire word space between two black spaces. c. is not interrupted by a blank black space. d. is not formed by linking letters diagonally. e. is not formed by reading letters from the bottom to the top or right to left. 7. The complete words in the CASHWORD PUZZLE 1 and PUZZLE 2 are defined by the Vermont Lottery and are the only words that can be used to win a prize in the CASHWORD game. 8. If you win in the CASHWORD PUZZLE 1 or PUZZLE 2, and any one of the completely uncovered words has a ( ) symbol in the word, win DOUBLE the prize shown in the prize key. Money bag ( ) symbol = free letter. 9. The BONUS WORD is played separately from the CASHWORD PUZZLE 1 and PUZZLE 2, and cannot be combined with words on the CASHWORD PUZZLE 1 or PUZZLE 2 to win a prize. 10. Each puzzle is played separately. Enter your non-winning SUPER COOLEST CASHWORD! 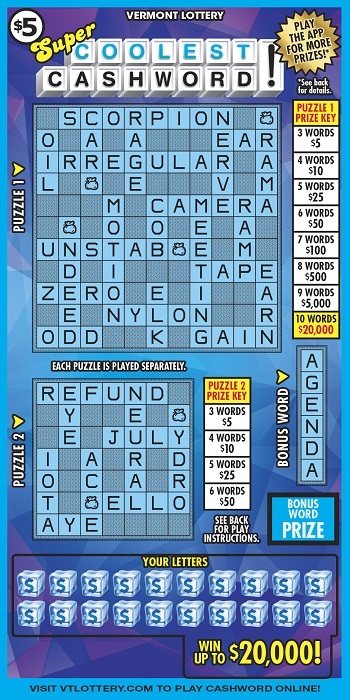 tickets to play Cashword online and win entries into promotional drawings for cash prizes! Any non-winning tickets entered will also be entered into the 2nd Chance Quarterly drawings. You can also just play Cashword for fun! Click here to enter your tickets and to play Cashword online.